In the absence of any definitive figures, I’m going to cave in and do what I always criticise others for doing- jump to a few conclusions, engage in a bit of hyperbole and speculation and all the rest. 1. Judging by reports from several areas, Labour has finally abandoned- and been abandoned by – Ireland’s working class. The party of Connolly said “Yes”, those who still believe in his ideals said “No”. Soon to join the PDs, and not before time, they sold out their principles so that the old guard could have one last grab for power. History will not be kind to Europe’s most right-wing worker’s movement. 2. Enda Kenny is a pathetically inept politician – but that doesn’t matter now, as we’ve ceded everything to Europe. Political history will pass a harsh judgement on Kenny’s hide-and-seek act; holder of an office already gelded by the ineptitude of his predecessors, he gave the rest away without a fight. 3. Twitter is a terrible barometer of political sentiment. It failed to adequately reflect the fear and confusion experienced by most Irish voters as they went to the polls. The yes side mostly came across as braying idealists, the nos as merchants of doom. But worst of all were the parties themselve, and the odious ógras that polluted the timelne of every broadcast debate with scripted, inane platitudes that contributed nothing. The born-again fervour of those in charge of the official accounts of the political parties indicates that they clearly have no understanding of social media, or of democracy in genreal – it’s a dialogue, not a broadcast medium. And shouting your opinion is bad manners, wherever you do it. 4. Markets continue to slide, indicating the irrelevance of a Yes vote. Whereas a no vote- similar to those in genreal and presidential elections in Greece and France respectively – would have given pause for thought, we have silently acquiesced. We were essentially voting on behalf of everyone who couldn’t, and there’s a good chance we disappointed a lot of them. 5. In voting yes, we have enshrined the ideology of small government in the constitution. This is the single most damning effect of the treaty, as it limits governments in the application of Keynesian solutions to economic problems. Despite market reaction to austerity and debt, despite Bo Lundgren (architect of the solution during Sweden’s 90s crisis) saying stimulus is a necessary as austerity, despite Nobel laureate Paul Krugman’s late statements, we did what the neoliberal movement all over the world has envisaged, and voted to enshrine their ideology as part of our national laws. Just as this treaty had no chance of bringing stability (check out the indifferent market reaction), the fiscal treaty itself cannot bring certainty. Different problems and different circumstances call for different solutions- instead of having the freedom to choose from them, we have gone ahead and written the only ones proven not to work into law. Angela Merkel addresses the Greek people. As the euro slides inexorably towards the abyss, it’s hard not to feel that Angela Merkel has, like Tony Blair and George W Bush, sacrificed her legacy on the altar of her ego. Reports today say that she suggested that Greece hold a referendum on euro membership alongside its general election on June 17. The cracks in the euro are not beginning to show, as they have been visible for a long time – but now, we are finally seeing the daylight in between them. With the Greeks voting for chaos, and Ireland being bullied into voting yes to decades of austerity, there is one fact that is worth remembering above all else. Every single thing we were told would stabilise the euro has failed. Blanket bank guarantees have failed. Bailouts have failed. Austerity has failed. Given these three embarrassing strikes, it is only fair to assume that the ESM will fail too, given that the architects are the same. They keep rolling the dice, and they keep coming up with nothing. And once more, it will be because of simple mathematics. Rumblings this week suggest that Spain is in trouble, and as we have seen in Ireland (remember “the cheapest bailout in history”? ), these rumblings often turn out to be worse than first thought – a whole lot worse. The speculation around Spain (and France, and Italy) suggests that the bailout this time will be measured in the trillions. That is money that Europe doesn’t have, no matter what way Greece or Ireland votes. No ESM will be able to save them. The markets, of course, know this and they have priced it into their calculations. The head of trading at a Swedish bank told me as much recently, saying that the euro in its current form would soon be a memory. He’s not a man who gets calls like this wrong. This market reaction is why an increasing number of countries are now outside the bond markets, with little chance of getting back in. Plenty more will join them soon. But instead of doing the one thing that would quicken the return to the markets – a purging of bank debt – Angela Merkel continues to insist that austerity is working. 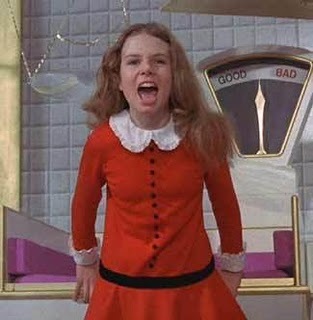 Like Veruca Salt, she wants it all, convinced that she can have austerity and growth at the same time. She might want it all, but she’s going the wrong way about getting it. And if she keeps insisting she can have it, she’ll be headed off down the chute to join Blair and Bush as political pariahs, destroyed by their own hubris. It’s something that neither of us draw any comfort from, but for once I find myself in agreement with Declan Ganley. The immediate solution is to purge the bank debt; the future of the euro – if there is to be a future – will be to greater harmonise the disparate economies that make it up, so that they can no longer fall out of step as drastically as they have done. In short, with a little more sensible regulation and a purging of debt, the solution to Europe’s problems could we be exactly the same as their cause.